WASHINGTON, D.C. (NBC News) – Lawmakers say they have reached a deal “in principle” to fund border security and avert another partial government shutdown this Saturday, but all bets could be off if President Trump’s demand for border wall funding isn’t met. Multiple sources tell NBC News that the deal includes: $1.3 billion for 55 miles of “steel slats” and other fencing, plus $1.7 billion for other security measures like technology and more border agents. The deal does not include funding for a concrete wall at the border. 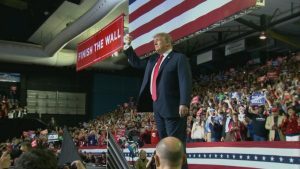 The agreement came after a weekend of stalled negotiations, and just ahead of a “Make America Great Again” rally that President Trump held in El Paso, Texas, on Monday night. President Trump says he’s “not happy” about the proposed border security compromise deal negotiated in Congress, but says he doesn’t think a shutdown will happen – with a Friday deadline looming.